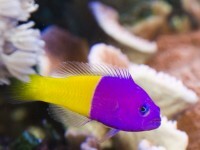 Pseudochromis, also known as Dottybacks, are brightly colored, and reach a size of three inches. They are very hardy aquarium specimens that adjust well to captivity. Pseudochromis feed on plankton, small crustaceans, worms and will accept most prepared foods. The aquarium should include a well-sealed lid, and plenty of rockwork and hiding places. Only one species should be maintained in an aquarium.